In 1967, future president Ronald Reagan was inaugurated as governor of California, The Beatles released "Magical Mystery Tour" album and Mark Hall began his career with what would become Linetec. Reagan left the governor's office in 1975 and The Beatles broke up in 1970, but Hall is still happily at work today. "I was 19 years old and a year out of high school when I started at Wausau Metals (now known as Wausau Window and Wall Systems), making $1.75 an hour," Hall says. "I was part-time at first and worked in shipping, crating windows and loading them onto the truck. For extra hours, I'd clean anodize tanks. In May 1970, we added color to the anodize tanks and I moved to third shift. I've been there ever since." 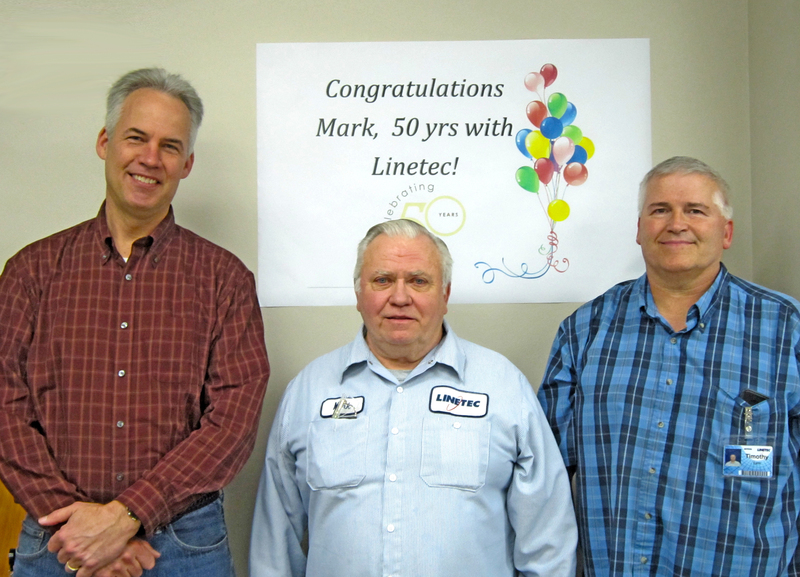 According to Rick Marshall, Linetec's president, "Linetec is honored and thankful to have someone of Mark's loyalty, commitment and expertise. He was the beginning and foundation of the anodizing business for Linetec." Hall has seen significant changes at Linetec throughout the half century. He continues to be amazed at the growth of the company and the pace of technology that has improved efficiency and quality. "I used to have four people working with me to manually move the anodize loads from tank to tank. We'd set timers for each tank load to move to the next tank. Buzzers were always going off. Now, it's just me running the line and everything is automated. The loads are bigger, but they take less time." He continues, "Back then, normal rework was 30 to 50 percent. A day with just 25 percent rework was great. Today, our rework goal is less than one percent!" One thing Hall says has not changed during 50 years is the quality of the people—something that, along with a reliable paycheck and good benefits, has kept him loyal and happy at Linetec for so long. "I've always worked with great people," he emphasizes. "I appreciate our teamwork and have enjoyed training many of our current tank operators." 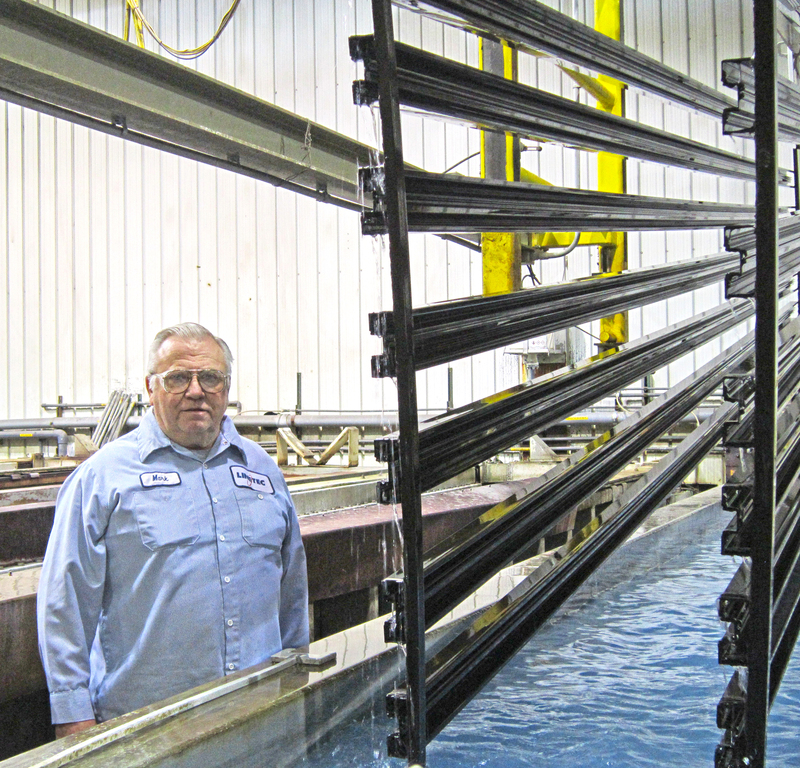 "Mark has set the standard for not only tenure at Linetec, but also in quality and consistency of our color anodizing. He remains the most consistent quality anodize line operator Linetec has in its ranks," praises Andy Joswiak, vice president of operations. 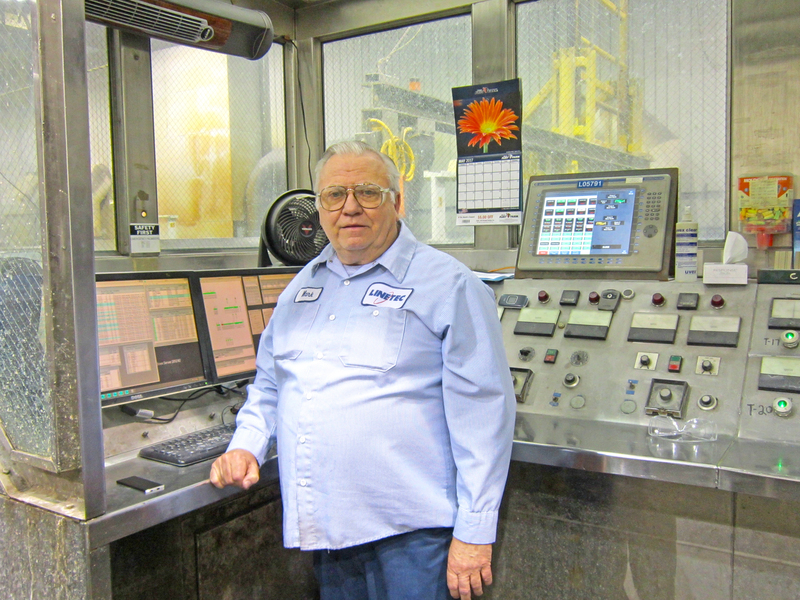 "During my 11 years as Mark's supervisor, he has always been very professional and does his job very well," reiterates Tim Lynn, "Drawing from his many years of knowledge and experience, he matches the customers' requested color with one of the highest accuracy rates of all the tank operators throughout the anodize plant." "I have a lovely wife, two daughters and two sons. I worked so many hours my kids would want pizza for Thanksgiving so they could have an 'everyday meal' with their dad," he says. Hall has no plans to slow down or retire, but says, "If I ever retire, I'd probably help out at the Humane Society." Hall's 50th anniversary celebration breakfast was held May 4. Jane Kessel, vice president of human resources, notes, "The 50 years of knowledge that Mark has helps us ensure our customers get the highest quality anodize finish. It's also a tremendous asset to our newer team members—especially during the extraordinary growth the company is experiencing." For more information about Linetec and its employment opportunities, please call 888-717-1472 or visit the "Employment" section of the website.